I don’t know about you, but after the glorious culinary abandon of the holiday season (I’m talking all the way back to Thanksgiving, people), my January is leaving me with a recurring desire to eat nothing but vegetables until summer. Will it actually happen? Of course not. But that desire, coupled with the recent glut of purely white breads in my freezer, has left me craving something more rustic, more grainy. And there are few breads I know that take better to the addition of whole grains more than the English muffin. English muffins, as such, possibly originated as a way to use up little leftover bits of bread and biscuit dough; but there is such a long Welsh tradition of cooking bread on hot stones and hearths, not to mention the popular and similar crumpet, that it seems they must have been a creation all of their own. A recipe first appears in 1747, clearly disproving theories of origination in Victorian times, or even of an American creation (yes, I saw a website claiming that). Certainly, the term “English muffin” was not used until the food made its way to the USA – do we call our cupcake-like muffins “American muffins”? – but the culinary tradition of the English muffin is well-established in the UK. Interestingly, though, the cosmopolitan Thomas Jefferson enjoyed a similar muffin at Monticello. 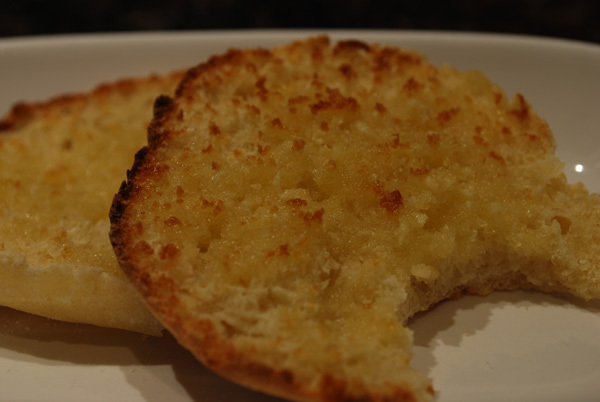 Typically made with butter and milk in the dough, the English muffin is similar to a crumpet: they are both cooked on a griddle, and both feature large, bubbly holes perfect for catching melted butter. But the crumpet has a more pancake-like batter, and is cooked in round molds, where the English muffin is more bready, and is cut or shaped before going on the griddle. Also, the crumpet’s holes are in the top of the bread, where the English muffin’s holes are safely tucked away inside. In addition, the English muffin features a thick dusting of cornmeal over the dough that cooks into a satisfying, crunchy crust. One caveat about English muffins, though: please don’t cut them apart with a knife! Split them with a fork to retain the characteristic nook-and-cranny surface. When you toast it, the surface gets variously-textured, alternately chewier and crunchier. You lose that wonderful and unique trait when you just cut them open. Served warm and spread with a pat of quickly-melting butter that pools in the holes, there can’t be much better. Ooh, unless you make a sandwich with it, of course! Scramble an egg, spread some pesto over the muffin, layer with parmesan or cream havarti… heaven! Or maybe Nutella and banana slices? What about peanut butter, honey, and cinnamon? Use them instead of hamburger buns! Oh, the endless possibilities! 1. Combine warmed milk and honey in the bowl of a stand mixer and stir until dissolved. In a separate bowl, dissolve the yeast in the warm water. Let stand until creamy, about 10 minutes. Whisk flours, flaxseed, and salt together in a bowl. 2. Add yeast mixture, butter or oil, and half of flour mixture to the milk. Attach the dough hook and beat at a low speed until mostly smooth. Add flour by the half-cup until a soft dough forms. The dough has the right amount of flour when it pulls into a ball and cleans the sides of the bowl. It will take a moment for new flour to incorporate into the dough. 3. Move the dough to a greased mixing bowl, cover and let rise until doubled, about 1 to 1 1/2 hours. 4. Sprinkle a work surface with flour, and sprinkle a rimmed baking sheet (or more counter space) with cornmeal (don’t be shy with this). Punch down the dough and move to the floured surface. Cut the dough into 8 pieces. Roll each piece into a ball and place on the cornmeal, leaving 2-3 inches between the muffins. Slightly flatten each round and sprinkle thickly with more cornmeal. Cover and let rise 30 minutes. 5. Preheat the oven to 350 degrees. Heat a greased griddle over medium heat. Gently brush excess cornmeal off muffins and place on the griddle, flattening if necessary, and cooking until a deep golden brown, 5 to 7 minutes on each side. Place on a baking sheet and bake for 5 minutes or until the edges feel firm. 6. Cool on wire racks about 5 minutes. Split with a fork and toast before serving. 1. I added flaxseed to the dough because I just love its texture in bread, as well as the nutty flavor it adds. (Try it in banana bread instead of nuts!) If you don’t like flax, or don’t have it, you can substitute 1/2 cup regular rolled oats, or an additional 3/8 cup or so whole-wheat flour (the flour absorbs more water than the flax, so reduce the amount. Add the flour bit by bit until the consistency is correct.). 2. I used olive oil instead of butter, though butter will give a more traditional flavor. 3. The cornmeal is part of what gives the muffins their lovely crust. You can use flour, but I suggest not to, if possible. 4. Any pan will do for a griddle, but the larger the pan, the more you can cook at one time. Cast iron, though, is perfect if you’ve got it. And don’t crowd them all in there at once! You’re trying to grill them, not steam them. 5. I did not bake mine at the end as suggested. I overcooked the tops and bottoms in the pan, so that they came out nearly black, but the sides were firm. I put them in a ziploc and into the freezer, to be thawed out in a warm oven later, then split and finished cooking in a toaster or under a broiler. 6. Hand-shaping these rolls results in a very round muffin, which cooks a bit unevenly in the pan. If you want them to cook more evenly, you can roll the dough out flat and cut them out with a biscuit cutter. (Or you can use my biscuit cutter: a tuna fish can opened at both ends. Yes, it’s clean.)6. The recipe calls for a stand mixer, but it can easily be made by hand instead.